Since 2015, the city of more than 2.5 million people has committed significant resources to improving road safety, with support from WRI Ross Center and the Bloomberg Initiative for Global Road Safety. WRI has audited 14.4 kilometers of traffic corridors and 10 of the busiest intersections, passing along infrastructure recommendations to the city. Recommended safety measures included redesigning intersections, improving sidewalks, marking crosswalks and creating public plazas. The intersection was reduced in size by extending footpath curbs and traffic islands. This helped control traffic speeds and resulted in shorter pedestrian crossings. Islands were modified to better channel traffic across the intersection in a smooth and safe manner. The pedestrian refuge in the median was expanded. 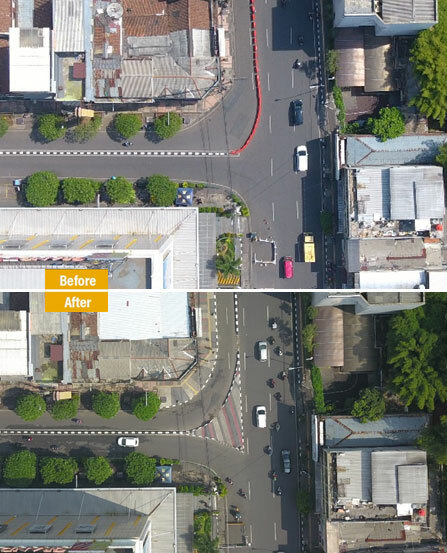 Follow-up assessments by WRI and the city depicted increased safety levels for all types of road users, and surveys indicated an increase in perceived safety by pedestrians. Former Mayor of Bandung, Mochamad Ridwan Kamil, formally acknowledged WRI’s assistance and the redesign’s potential for tremendous impact in the region. The IRSAs were created in 2013 to spread awareness of road safety challenges in Indonesia and award those who have made important strides during the previous year. This year, a total of 137 cities and counties participated in the award ceremony, and ministers from the National Planning Agency and Ministry of Transportation were in attendance. From Bandung, the vice mayor, head of the planning agency, head of public works, and head of the Department of Transportation attended.